New beauty products released by one of my favourite Youtubers? Umm yes please! 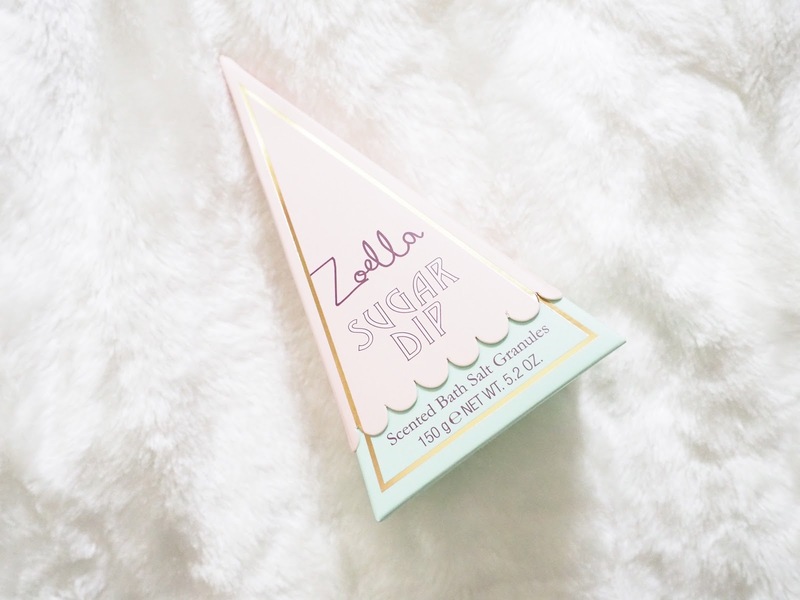 I'm a sucker when it comes to new beauty purchases, so obviously I had to get my hands on some of the new beauty products created by Zoella. I haven't actually purchased that much from Zoella's range before, just because I don't tend to pamper myself that often (cos I'm lazy). However, this collection really grabbed my attention because it's just so 'me', from the packaging to the scent and everything in between. This collection really does make me want to pamper myself that little bit more. I decided to pick up the mist, bath salts, body lotion and the beauty bag. Obviously this was the first item to be placed into my ever growing basket as I am obsessed with perfumes/mists - I think I own around 14, which yes is excessive but I like to smell nice and different ok? I am completely in love with the packaging as I love anything baby pink and gold. The pattern reflecting through the clear glass bottle is also really eye catching and not a pattern I've seen much of before. The scent is gorgeous and includes Sweet Almond, Honey and Cocoa. Who can resist a body lotion that smells this good? Clearly not me. The body lotion is such a decent size, especially when you consider how inexpensive this product is in comparison to other body lotions of this size and quality. Again, the packaging is just so cute and baby pink and white stripe pattern is beautiful. I'm too excited to use these bath salts and smell absolutely glorious! The next time I have a bath I will be using these for sure. Can we just take a moment to talk about the packaging? I love the cute little 'sweetie' bag that the bath salts come in (it makes me want to eat them) and I also really love the pyramid box that these salts are housed in. I never want to throw it away! This makeup bag is literally the cutest thing ever. I love the pale lilac colour of it and the scallop edges - it's super cute and very Parisian. I use this bag to store girly bits and bobs that I take with me to work, as it's just the perfect size and looks really pretty. As you can tell, I'm a little bit of a fangirl when it comes to the new Zoella Beauty Sweet Inspirations range, but who can blame me really when it smells this good? If you haven't managed to pick up anything just yet, I highly suggest you do as the products are just beautiful! Make sure to check out Superdrug as they are currently offering 3 for 2 on all Zoella beauty products (this is what I did and I managed to save quite a bit of money, which my bank balance is always thankful for).